I saw, photographed, smelled, touched and even stood inside what are—as far as we know—among the oldest living things in the entire world. 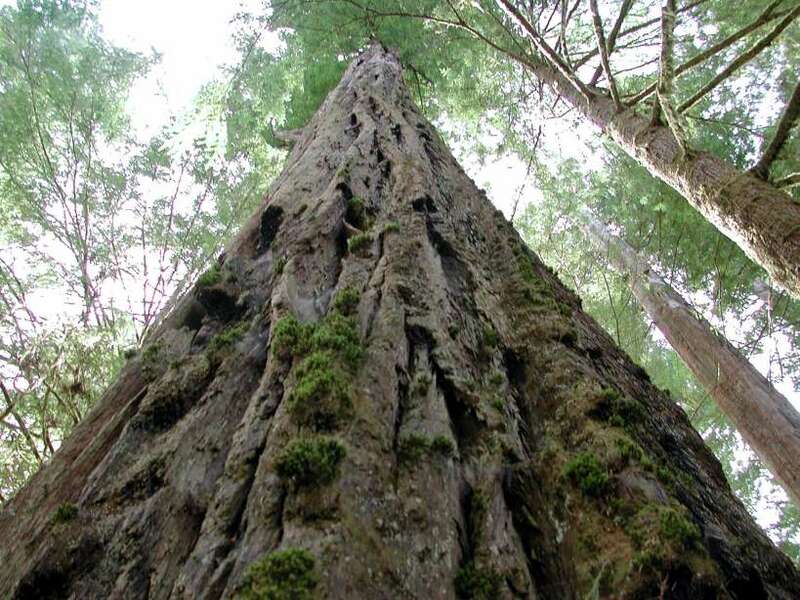 Apparently the great Sequoias are the oldest trees, a sheer 4,000 years as compared to the Redwoods’ paltry 1–3,000. It was amazing just to be in such a forest, much less among that kind of ego-dwarfing natural occurrence. These are the moments when I feel closest to divinity, and not even the mightiest spires of il duomi dell’Italia can compare to the architecture of Redwood. God is, of course, on my mind a lot during this journey.There’s nothing for a reaffirmation of one’s faith in a higher power than being immersed in need for such guidance and support.I’m spending a lot of my time just trying to be ready for whatever David needs, and thus far it’s not much in the way of practical help, just someone to keep him in the moment and remind him he’s not alone.In fact, we’ve had some conversations about things like theatre and life in general the likes of which we haven’t known since the first year of working together, when we were just discovering how much we enjoyed one another’s company.It’s hard to say if that’s a direct result of recognizing how fleeting such moments can be, or just a side effect of spending a significant amount of time together again.It’s not all that important to me to come up with a reason, either. Ann Zarko really was an amazing woman, by all accounts, and she and her son David are unusually deserving of one another.It’s easy to see where David gets his compassion, openness and love of life from.I wish I had known Ann.Everyone we speak to not only has their own important memories of her, but says the same thing eventually: They know that everyone will miss her, and she will be remembered by a lot of people.She was continually making new friends, and nothing about who she was faded, even in her final days.Tomorrow evening will be a viewing and rosary, and Thursday morning will bring mass and the burial.David’s being almost stubbornly strong.I hope he can find times to let himself go in the coming days.He loves his mother very much. Possibly more magical even than BigBasin, yesterday David also gave me a walking tour of his life around my age…say 25 to 31.It happened rather spontaneously in the early evening, driving through Santa Cruz (where I now plan to retire once I’m Absurdly Wealthy & Famous) after the forest.I think David was a little embarrassed by his want to share those stories, but I couldn’t have been more excited to get that peek into the early years of Zarko.Santa Cruz is now very reminiscent to me of Austin.Well, maybe a blend of Austinwith Old Town Alexandria.It’s very funky and artsy, not just with college kids but a good proportion of twenty-somethings and young families.The Mall-like stores are definitely moved in, but I would say local businesses are still dominant.Apparently when David was there it was not even in a larval state of this resurgence, and his nostalgia is clearly tinged with a love for what was once run-down, as well as some envy of the success the town has known since. He told me about opening his café there (stock Zarko lore) and I actually saw the building and bought coffee from a well-pierced prepubescent there.He told me about being young, and his friends at the time, and hanging out with Spalding Gray before he was Spalding Gray.Best of all, he explained to me why his theatre company at the time was named “Parcifel’s Players.”When he was young (and, I’d wager, on into this day) David loved this story of the knight, Parcifel (or Percival, or Pursifel, etc. ).As we walked the darkening streets of Saint of the Cross, he told me the story as he had heard it, of a knight so foolish that he barely got by.His mentor ultimately instructed him, out of irritation for his inability to understand things innately, never to ask any questions of anyone who was his superior. One day, Parcifel, quite by accident, bested the red knight who had been plaguing the court of King Arthur.As he walked into the castle in the knight’s armor, he was greeted with great enthusiasm. In order to complete his status as a knight of the round table, however, he of course had to go on a Grail quest.Parcifel does so, and finds a castle that promises the Grail.The duke of that castle promises him the Grail, they proceed through various ceremonies and celebrations.During this revelry, Parcifel has the impulse to ask three questions, but resists according to his mentor’s lesson.When he awakes in the morning, he discovers the castle long abandoned and dusty, the formerly lush surrounding lands barren, and an old woman who bears a striking resemblance to a young lady who had entertained him the night before informs him that if he had only asked his questions, the Grail would have been his. So Parcifel, feeling the utmost failure and shame, pledges never again to return to Camelot until he rediscovers the Grail.He spends years and years traveling the countryside, deposing evil knights, saving the people from harm and spreading the good word of Arthur.Finally, in his late years, he encounters a knight and by custom challenges him.The challenges begin with insults, and as these insults progress it becomes clear that the two knights share the same father.They throw down their arms and armor and embrace, and suddenly the castle reappears to Parcifel, this time he asks the questions (which have changed) and achieves the Holy Grail. This is a powerful insight to life, to the idea of always having to learn and relearn, to question and accept.It’s also a great peek at what it’s like to work on a show with David.His rehearsal is concerned with process, always process, and he understands that you may achieve brilliance quite by accident, and it will be impossible to return to that brilliance without time, effort and more time to understand something larger than yourself.It’s hard to accept that we don’t know.It’s hard to go on in good faith in the face of that.It’s worth it.That’s what I think.Maybe there is no grail at the end; it’s still worth it.Lao Tzu reminds us that the journey of a thousand miles begins with a single step.The Redwoods grow huge one minimal ring at a time.And life may be brief, but it is full, full, full. In"acting", "death", "faith", "family", "mythology", "philosophy", "theatre"